Yay we did! We made it to the end of the challenge. Today is Honor Nails You Love day. This prompt is so easy, yet so hard. I have so many manicures that I have snapshot-ed on my ipad because of their total awesomeness, so finding inspiration was easy. Settling on just one to recreate is so hard! In the end I went with a mani that I loved because a) it was gold and just felt like a 'me' mani and b) it was something that I had tried before and failed! 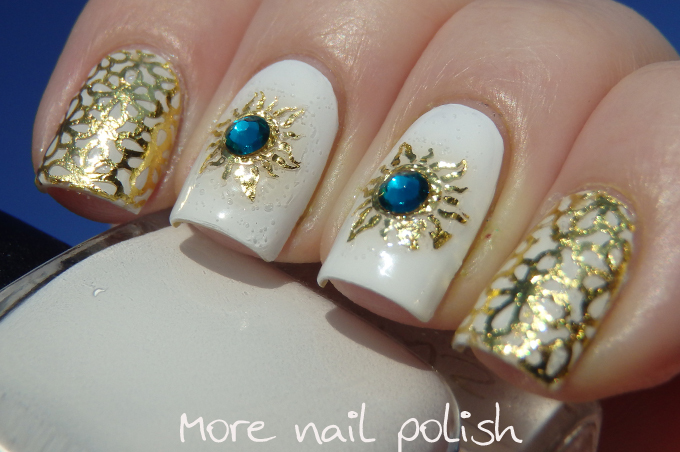 This is a white and gold mani featuring stamping with foils! 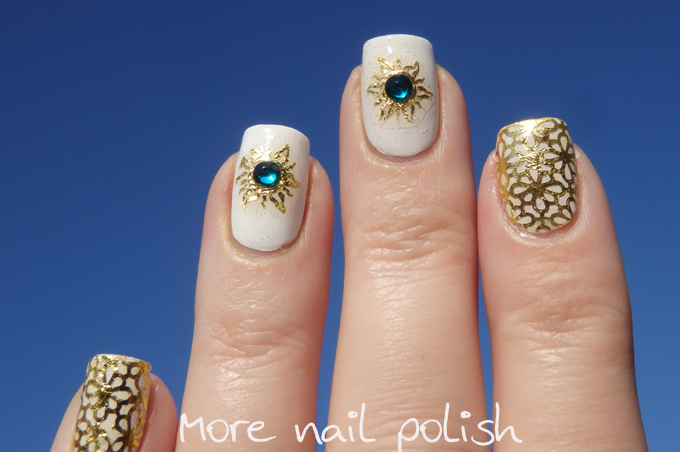 The nails I'm loving are by Eleonora over at Nail Art Stamping Mania. 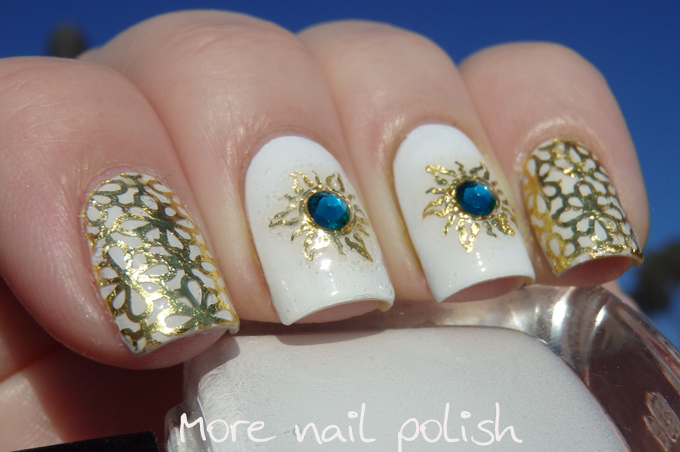 I used the same stamping image from QA65 from the Born Pretty Store. 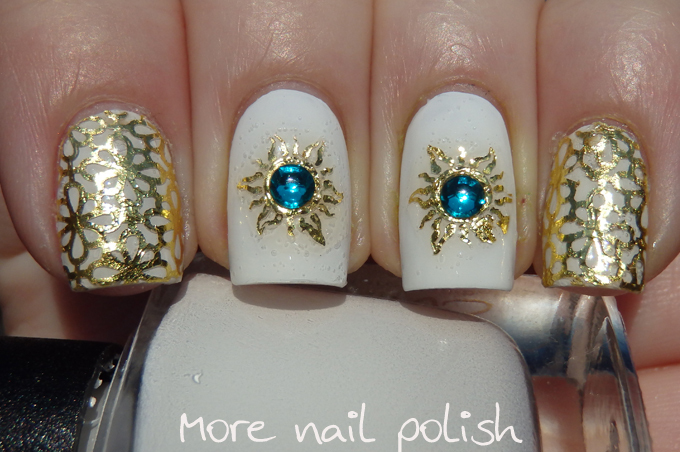 I didn't have the other image she used on the middle two nails, so I just used a different stamp, but still placed Swarovski crystals in the centre. I followed her video tutorial on how to stamp with the foils, and whilst it was a little tricky I was able to get a result I was very happy with. The only down side is that the stamping image is a little small for my thumb, so I didn't get full coverage with the foil stamping. My Honor nails from 2013! This is simply beautiful! I love it. Your foil nails are sublime! I really love what you did, and through your blog I found another great blogger, the one you got your inspiration from - thank you. Gorgeous nails! I always look forward to seeing what you'll come up with next on your blog. 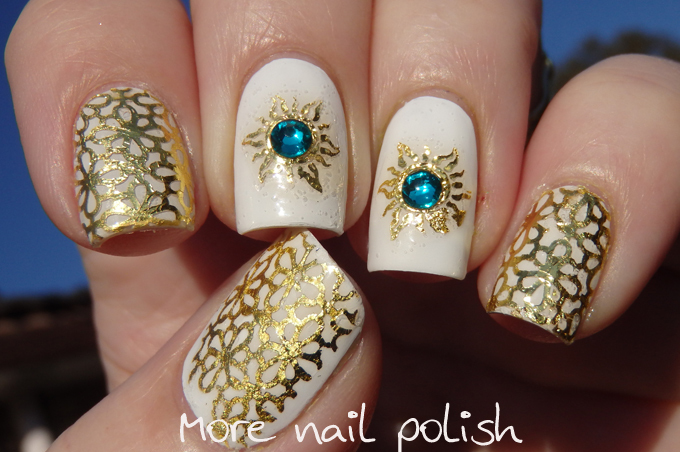 Oh wow, stamping with foils! Such a cool idea! I've never even SEEN this method! Incredible! What polish did you use to stamp under the foils? I used Mundo de Unas, by Nail Art Stamping Mania did it with Konad polish.